Abuja — Former President Olusegun Obasanjo yesterday declined to comment on President Muhammadu Buhari's victory at the presidential poll held on February 23, 2019, saying it would be subjudice. The former president spoke at the Shehu Musa Yar'Adua Centre Abuja, during the launch of a book: "Election in Nigeria: The Long Road to Democracy," written by Prof. Abdullahi Shehu. The event attracted very important personalities, including a former Head of State, Gen. Yakubu Gowon (rtd); human right activist, Mr. Femi Falana SAN, and a former Deputy Senate President, Senator Ibrahim Mantu, among others. Obasanjo said: "I will not dabble into the details of what I call current aspect of Prof. Shehu's book because since the emphasis was on the national election, particularly the presidential election, and the presidential election is now taken to court. "I think talking about it would become subjudice, because it has been taken to court." 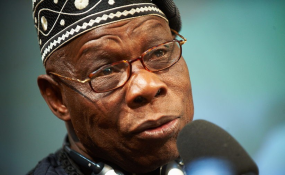 Obasanjo, whose preferred candidate was the flag bearer of the Peoples Democratic Party (PDP), Alhaji Atiku Abubakar, has not offered any comment since the announcement of the result of the poll last month. Atiku, however, rejected the outcome announced by the Independent National Electoral Commission (INEC) and challenged it at the Presidential Election Petition Tribunal (PEPT) on Monday, asking to be declared the winner of the contest.